If you missed the previous posts in this series, you can see Where to Begin & Planning Your Sale here and Making Great Signs & Advertising Tips here. This is by far the most time consuming part of the sale. 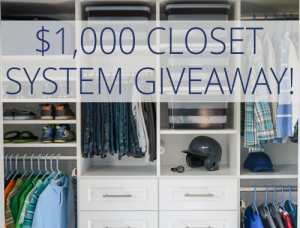 Many people don’t have space in their homes to spread out all the stuff they’ve collected over the course of a year to organize and price it. I always have way too much stuff to spread out on tables in the garage (especially since I usually host a multi-family sale and everyone drops their things off at my house! ), so most of the actual organizing of things on tables is left until the day of the sale. Group like things together. As you store your stuff for your sale, try to keep things like housewares, home decor, seasonal decorations, toys, books, etc. together in boxes or bins. It makes it much easier to put them out on tables if they are grouped together from the start. Price a box at a time. I’ll talk more about pricing your items later, but one thing you can do to save yourself a lot of time on the day of the sale is to price things ahead of time. If possible, price things as you store them. 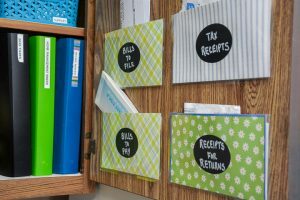 If you have grouped like items together as you’ve been storing them, it’s not too hard to grab a box to price when you have some down time (ha ha!). On the day of the sale, take your boxes and bins that have the contents grouped into categories (i.e. toys) and decide how much table space you need. 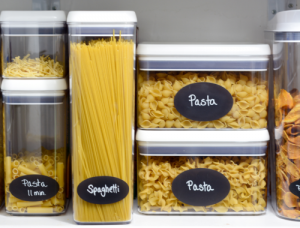 Seeing how many bins you have for each category will help determine the size of table(s) you need to display it. After you put everything out, store the bin under the table. Strategize like a store. Stores put a lot of research into what to sell and how to attract buyers. I’ve found if that item you were sure was going to sell first thing in the morning hasn’t budged, try moving it to a different table or lower the price ever so slightly. It’s crazy how changing the location or setup of something causes it to sell immediately. I am constantly changing placement of things during the sale and I know it works! Not too many sold. Especially considering how we just left a box and a large art pad on the ground. By that time I guess we were too tired (or were having too much fun :D) to notice. 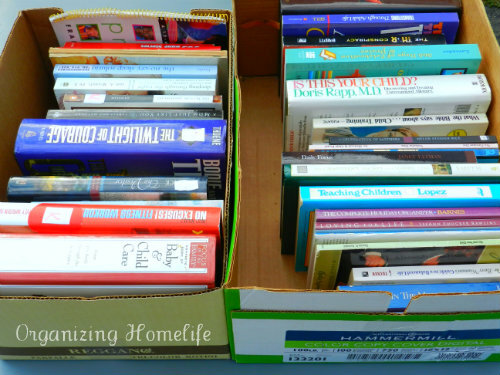 The next day, we stacked our homeschool books in boxes next to our regular book boxes. It was much more effective! If it’s not working – change it! Keep clothing separate. Spend some time before your sale putting sizes together, matching outfits, and pitching things that have stains. 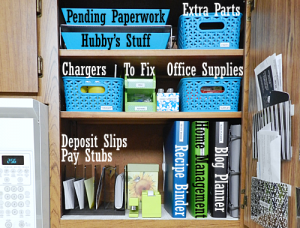 Your buyers will appreciate the time you spent in organizing your clothes. It makes a HUGE (temporary) mess, but it’s worth it! 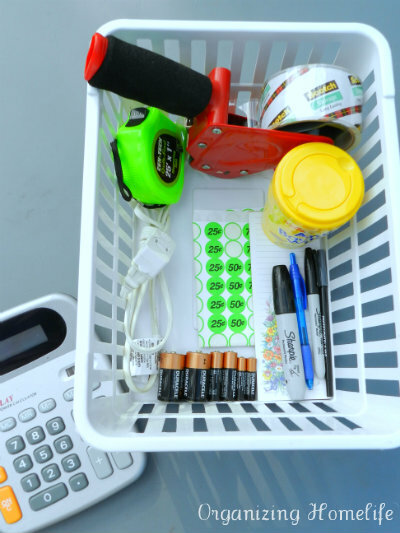 Try taking a box at a time and sorting it when you are watching TV at night. It’s best to have your clothes organized ahead of time. I do admit – this is a big challenge (especially when you have four children)! FYI – Don’t Miss This Tip! I like to price clothing by putting the price sticker on the tag. I learned the hard way that when clothes sit out for a day (or more), the sun slightly “bleaches” the clothing. It’s hard to notice until you take off the price tag. What remains is an unbleached spot on the clothing. That wouldn’t make too many buyers very happy to find that after they get home. Price as much as possible! Nothing irritates buyers like not having things priced. They DO NOT want to ask how much everything costs. I will say that I honestly have not always had everything priced before the start of the sale. It’s difficult to get it all done ahead of time and pricing everything is one of those things that often gets left until last. It’s not the end of the world, though! Pricing can go pretty fast when you use prepriced stickers. 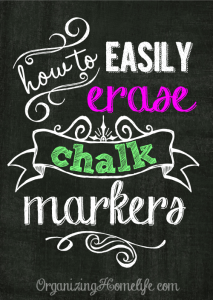 They save SO much time and are worth the extra minimal expense. Don’t make people pay different sellers! Buyers can get very annoyed by having to pay different people. 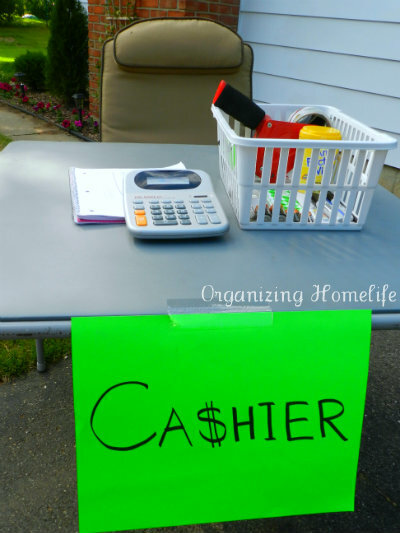 Have one “cashier” table (labeled!) where buyers can pay for everything. One of the best things to do when having a multi-family yard sale is to put your initials on the price stickers. I keep a notebook at the cashier table with the names of the sellers in different columns. 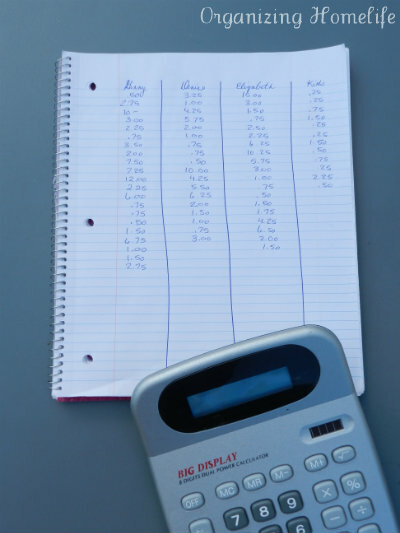 When a buyer is purchasing items from multiple sellers, I keep a running total on the calculator and write the totals for each seller in the notebook. When one column hits the bottom of the page, simply start a new page. Cash – I start with $100 in cash ($60 in 5’s, $30 in 1’s, and $10 in Quarters). It’s amazing how many people will hand you a twenty dollar bill first thing in the morning. It can eat up your change quickly. Lots (and lots!) of plastic grocery bags. I start collecting them weeks before our sale. Hand wipes there is always something (or someone!) that needs wiping off. I used to use a nail apron around my waist to hold the money (my husband informed me that it’s not called a nail apron because men do not wear anything called “apron”. However, he didn’t know the name for it either. Do you know what I’m talking about? It’s that little pouchy thing that holds nails and ties around your waist). It wasn’t very convenient if I had to lean over (change would spill out), and it really didn’t work when having a multi-family yard sale. We started using a cash box and kept the money together. Buyers love paying one person and it’s SO much easier than constantly trading money with your friends during the sale. 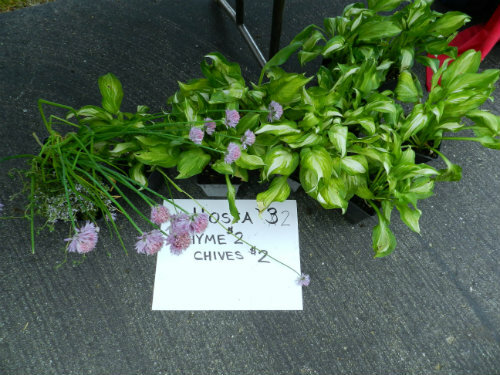 A few years back I had one of those “aha” moments when I was preparing for a sale. I picked up a muffin tin from the dollar store for $.50 and cut two sections off. I folded over the sharp edges and viola! 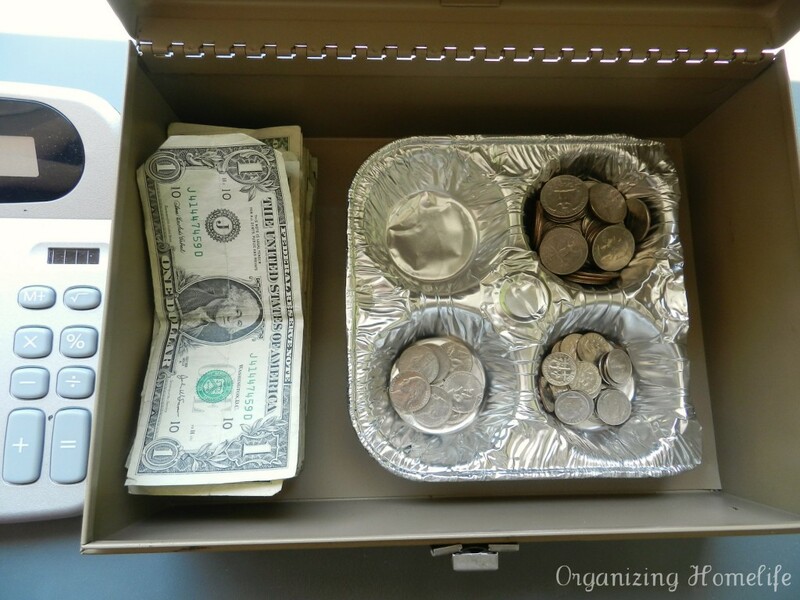 a perfect coin organizer that fits perfectly in our cash box! I know a lady who always under prices herself when she has a sale. She doesn’t wind up with very much at the end of her sale because she asks almost nothing for her high quality items. I find that it can be very difficult to know how much to price something, especially if you have had it for a while. It’s easy to remember how much it cost you and that can make it very hard to part with it for “nothing”. However, over pricing something results in a no-sale. Try to imagine going to a yard sale yourself and decide what is the most you would pay for it. Lean towards asking more – I have noticed when selling with friends or family, they tend to under price things because they feel like it’s “old” since they’ve had it for a while. 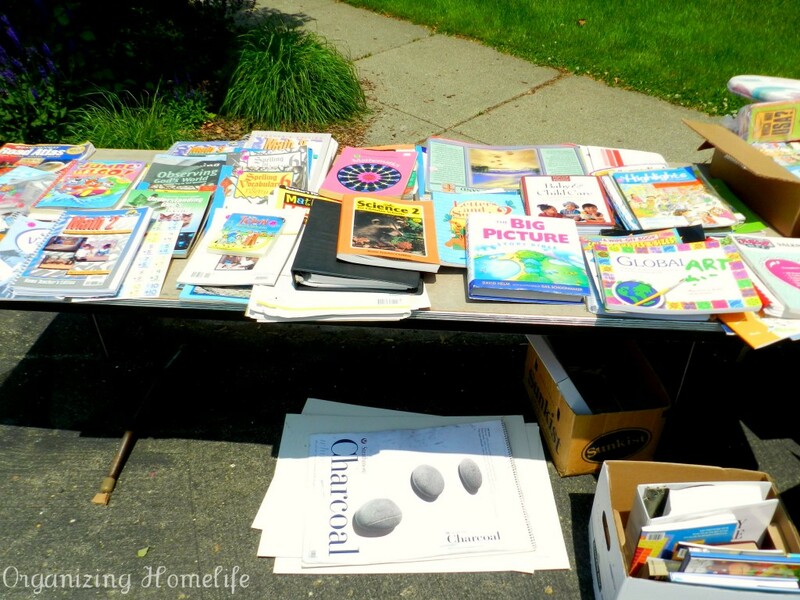 Let’s face it, you’re having a yard sale to earn money. If the only reason you are having a sale is to clear out junk, take my advice and save yourself a lot of effort and donate it! If you’ve gone to all the work of planning an excellent sale, make it worth your own while and don’t give things away for nothing (unless your goal is to help out your community, which is a worthy cause). Base your pricing on the item’s quality, not how long you have owned it. Got plants? Try selling them! I have lots of hostas which multiply quickly. Every year, I divide them near the time of our sale and sell them for $2-$3 a piece. It’s pretty easy to bring in $30-$40 with not much effort and they always sell. Offer a “free” box with small kids’ toys and other low value items. Plan your meals ahead of time. Where I live 2-3 day yard sales are popular. That’s a lot of meals to prepare for when you are exhausted! Try planning easy lunches (hot dogs in a crockpot :)) and dinners (tacos with the meat precooked and the fixin’s pre cut). Have everyone involved in your sale post it on their Facebook page. 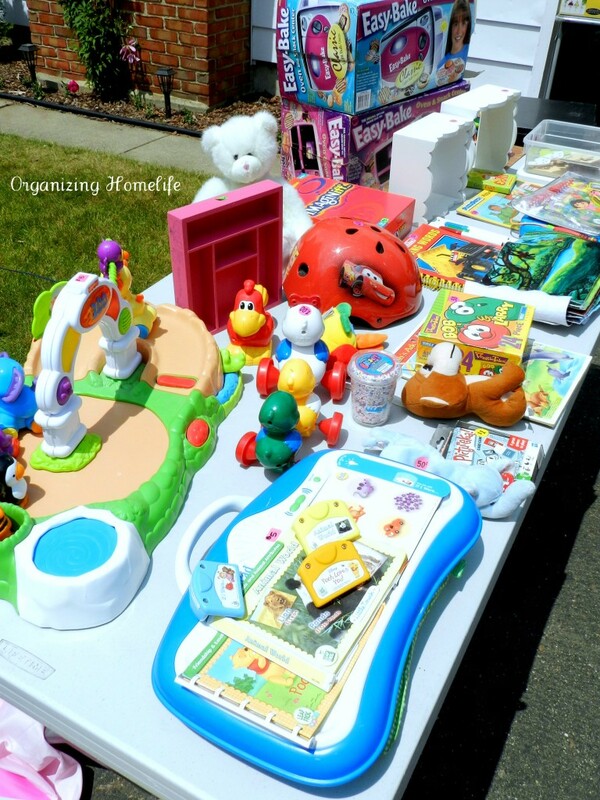 I hope these tips will be helpful to you when you have your next yard sale! 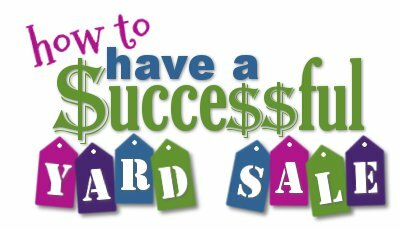 What are your favorite tips for having a successful yard sale? I would love to hear them! Day 4: Getting Kids Involved and Making it Fun! Thanks for all of your tips! Just in time for our neighborhood yard sale next weekend!! 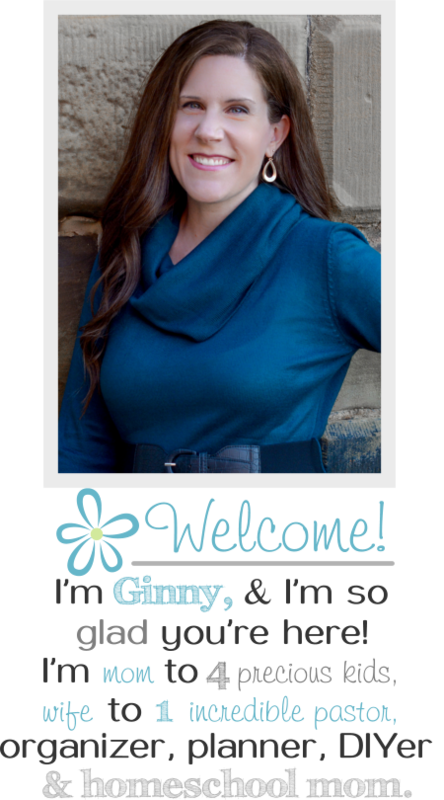 Be sure to come on over and visit at http://www.Palmettosandpigtails.com because I’m having an organic kids’ stuff giveaway this week! Great tips! A friend and I did a yard sale together for the first time last year and keeping track of the money did get a little confusing. 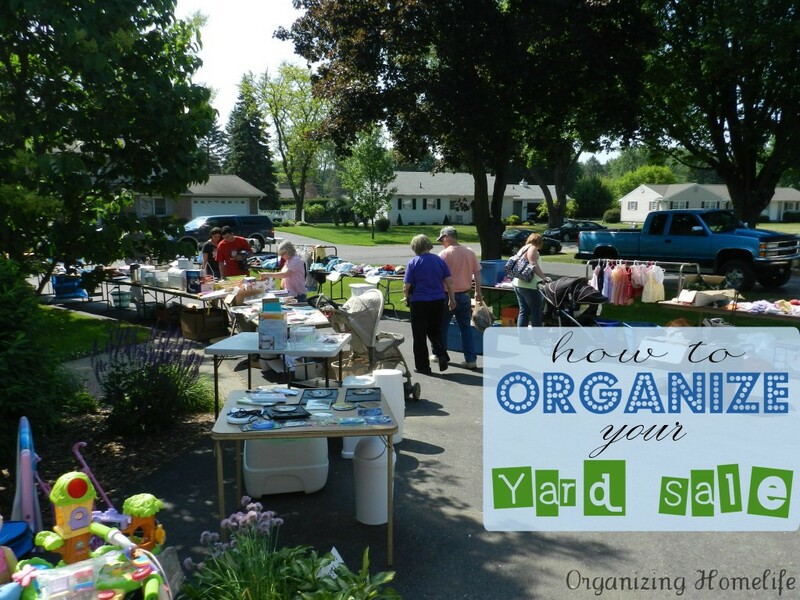 I can’t wait to try your tips for this year’s yard sale! 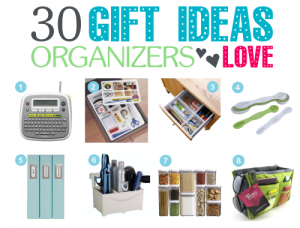 Love your great ideas! Our family does an annual sale, and we don’t use the grocery store plastic bags any more,but we do save those fancy shopping bags we get throughout the year to use at our sales. Our customers love taking their treasures away in fancy bags. It’s gotten to be a “thing” for our return buyers! I agree with all you said above, but, I go a step farther. I make sure the things I put out for my sales are ironed, and hung nicely by size. Also, dishes, especially glassware is clean. I have found that people look at the clothes more and they sell for a higher price if they are ironed. I’ve been told I have very neat garage sales. I get people back year after year. I hate going to sales where things are still in boxes, I refuse to dig through boxes of clothing. Take pride in your yard sales, it’worth every penny you can make! This was an awesome article! Thank you so much for outlining this for us. I’ve organized at least one garage sale a year (and several, large-scale, multi-seller and charity garage sales) for the last 5 years. The only thing I would disagree with is if it’s not worth more than 25 cents, just let it be free. It may be a hassle, but there is NOTHING that makes me happier when going to a garage sale than to get something for less than a quarter. Let’s face it, four 25-cent items add up to a dollar quickly, especially when you are buying small items like baby clothing and tools. There are lots of baby items (washcloths, onsies, socks, hairbands, etc.) that would sell quicker and in bulk for less than 25 cents. Also, if I’m going to the trouble of having a garage sale, I’m going to *sell* my items. Somethings I understand could be free, but 5 cents is 5 cents, even if you think the item is worthless. I am not intending to start an argument, I just don’t want someone to feel as thought it’s rude to ask 5-10 cents for an item, rather than giving it away for free. Would it be tacky to post a sign saying all sales final? I had a yard sale once where a lady returned with an item (a toy doll) hours later requesting a refund. Not at all. If something is questionable, I do tell them to try it on site and if they are still not certain, make a judgement call and tell them if they are unhappy, reach out to you. they obviously know where you live. I have also told people in the AM, to buy, it take it home and if they don’t like it bring it back by Noon so you can resell it, if necessary. It has worked for me. Any creative ideas on how to hang items without a rack? 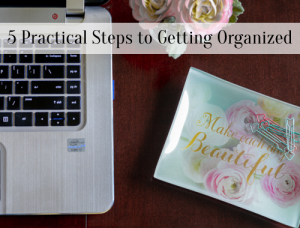 Great tips & cute website! I’m trying to plan a garage sale, but I don’t have a cash box and would prefer not to buy one. 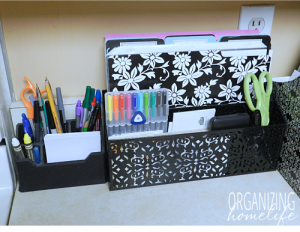 Are there any other ways to keep cash and change organized and safe? I plan on having pennies, nickels, dimes, and quarters at the ready too. Thanks. I use a cash box that was sold by Tupperware years ago. But it’s just a plastic sorting that with a lid, maybe a food tray/ container would work for you. Ask your bank. They may lend you one. Great ideas! Love the cupcake tin for change..